← Holy Cow! There is Robin Casting News! Odd news, everybody! Due to a couple different factors this week, the review pile is kind of small. For one thing, it’s a fifth Wednesday, so there were already fewer books being released, and most of the comics that came out I’m way behind on. For another thing, I have been laid up with a pretty bad cold all week, and I just didn’t feel like reading a lot of comics. Oy, this stupid cold. My kingdom for a cure! At any rate, I’ve only got two comics on the stack this week. I’m kind of taking it easy. 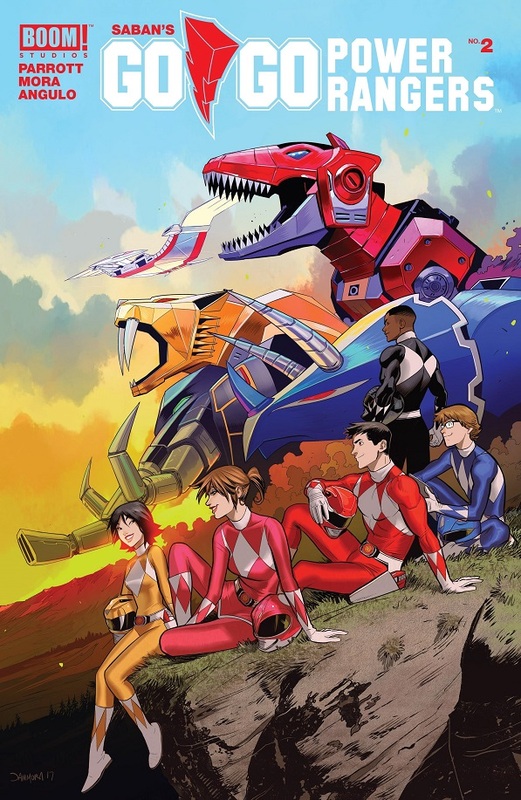 And out of the two of them, Saban’s Go, Go Power Rangers wins Comic Book of the Week! It’s almost as much fun as the regular Power Rangers comic. Secret Empire came to an end this week, and I couldn’t care less. I like the ambition and the general idea, but the ending isn’t anything special and the whole adventure lost steam awhile ago. It was a little too huge in scope and didn’t really earn its earnestness. Comic Reviews: Go, Go Power Rangers #2 and Infamous Iron Man #11. Go, Go Power Rangers is a new companion comic to Kyle Higgins’ regular ongoing Mighty Morphin Power Rangers comic. This one tells a Year One or even “Week One” style story about the first days of the Power Rangers. It’s pretty fun! On only their second day as Power Rangers, Jason leads his team straight up to the moon for a full-on assault of Rita’s palace! But the reason they don’t do that all the time is quickly revealed, as Rita is easily able to repel the Rangers and drive them out. They barely escape with their lives! Zach is a little upset that Jason tried to kamikaze solo attack Rita, leading to some tension. Meanwhile, Billy’s focus on Ranger stuff is starting to effect his focus at school, and Trini and Jason spend some time testing and learning about the limits of their new Ranger powers. The biggest reveal so far is that the Rangers once had another friend in their group, Matt, a jock. He started dating Kimberly when she first moved to Angel Grove a couple months before they all became Rangers, and he’s responsible for introducing her to everyone (though their initial meeting didn’t go very well). Matt was still around after they all became Rangers, and Kimberly’s new duties and secrets put a strain on their relationship. This comic could just as easily have replaced Higgins’ regular ongoing, it’s that fun and insightful. It gives the Rangers the same personal exploration, with the added twist that they’re all brand new to the Power Rangers thing. So we see their immediate reaction to their world being in danger, we see the reactions of their classmates and their city. We see the Rangers struggle with their new responsibilities, while also exploring just what they can do. It’s a fun comic and a very fun situation to explore. Comics like this are exactly what an old fan like me loves to see. This isn’t just a regurgitation of the old show, this is a new, fascinating exploration of the same fun material. 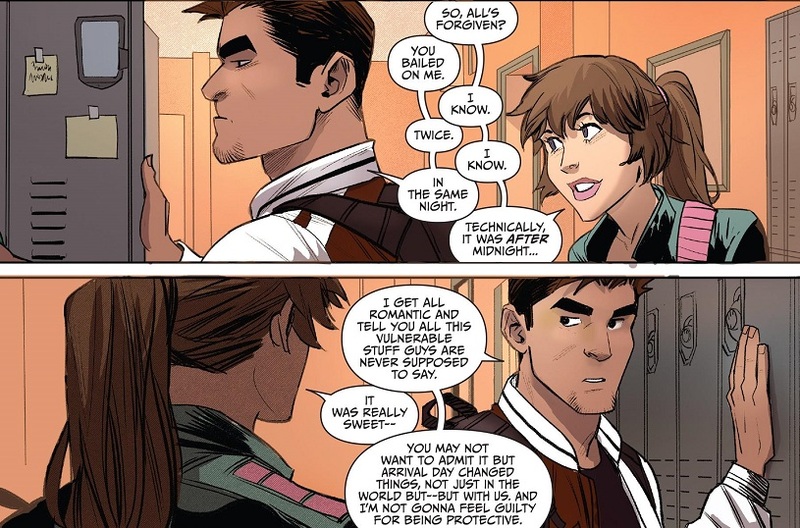 Just like with the main series, I love what Parrott is bringing to this comic. I love the idea that there was another member of their friend group, and I’m dying to find out what becomes of this guy Matt. Why wasn’t he chosen to be one of the Rangers? How does he get phased out? I love seeing Trini’s tiny crush on Jason, and using their Ranger duties as an excuse to spend time with him. I love seeing Billy get so worked up playing with the technology at the Command Center that he forgets to go to school. I love the idea that the Power Rangers, a little drunk on their own sudden power, decided to just invade Rita’s castle right away. This is such a fun property to explore! The art is also quite morphenomenal! TL;DR: BOOM! has found a worthy companion comic to their main Power Rangers series. Parrott and Mora are doing a phenomenal job exploring the lives of these brand new Power Rangers. I was surprised to learn that the next issue will be the last for Infamous Iron Man. All my favorite comics are getting short lifespans these days, without any warning. What a bummer. Victor Von Doom has turned himself in to SHIELD custody, and they’re holding him at Project Pegasus. Doctor Strange is called in to help mediate, and he goes into the cell to talk with Doom and figure out what has frightened his old foe so badly. The two meditate and discuss their shared history as Doom starts to see through Evil Reed Richards’ disguise. Meanwhile, Evil Reed arrives at Project Pegasus to offer his help with Doom, but SHIELD doesn’t give him an inch. Doom and Strange figure out the ruse and rush outside to help, just as Evil Reed drops his facade. Evil Reed is actually just Mephisto, who is angry that Doom could even think he could turn over a new leaf and escape his final, Hellish judgement. I’m a little disappointed in the reveal that the Maker is actually Mephisto. I haven’t exactly read a lot of the Maker (Evil Ultimate Reed Richards), so I’m not particularly connected to the villain. 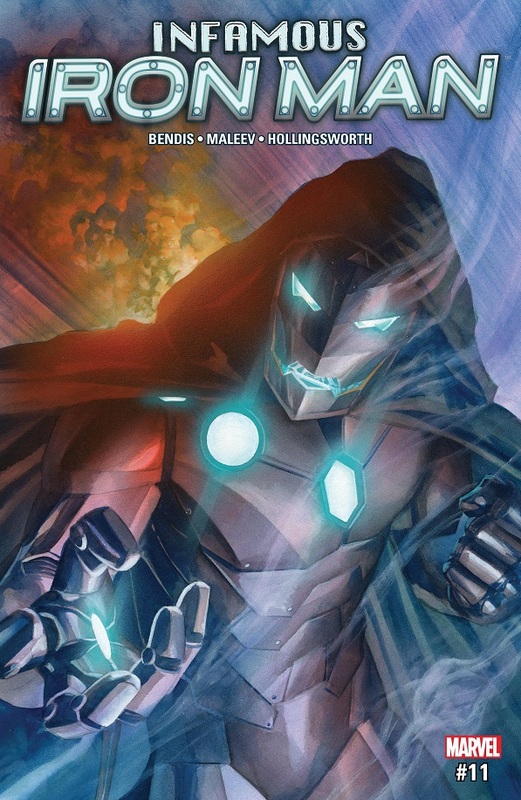 But the idea of pitting a good guy Doctor Doom against an evil Reed Richards is a pretty solid premise for a comic. Suddenly switching out Evil Reed for Mephisto feels like a cop out. There’s been no build towards Mephisto in this series, no foreshadowing or subtle hinting, whereas Bendis did a great job setting Victor against Evil Reed. It sort of feels like Evil Reed was the original plan, but when the order came down to end the series, Bendis didn’t want to devote page space to the drama that would come from such an encounter. Quick switch to Mephisto and you can wrap things up in a single, final issue. Beyond the twist, this issue was only mostly fine. Doom and Strange have a great relationship, especially in light of Secret Wars, which this series was born from. Part of me feels like their camaraderie could have been played up a bit more, but their encounter in this issue was fine. Bendis got some good dialogue out of them. Nothing as deep and as powerful as some of the past conversations in this comic, but it was still fine. TL;DR: The twist reveal of the villain leaves a lot to be desired, but considering this series is coming to an end, I suppose there’s nothing to get worked up over. It’ll fade away and we might never remember it existed. The comics I review in my Hench-Sized reviews are just the usual comics I pick up from my local shop an-y given week, along with a few impulse buys I might try on a whim. So if there are any comics or series you’d like me to review each week, let me know in the comment. Posted on September 2, 2017, in Comics, Marvel, Reviews and tagged Boom!, Doctor Doom, Go Go Power Rangers, Infamous Iron Man, Mighty Morphin' Power Rangers, Power Rangers. Bookmark the permalink. 1 Comment. Iron Man was fine. Still good writing and storytelling.